You are at:Home»Birds»Birds gone bald: What’s up with that? Are you scratching your head over bald Blue Jays or Cardinals? They seem to go about their bird business in the usual way, but something — a disease? an iniury? — appears to be seriously wrong. Well, as it turns out, it’s weird, but not serious. When birds molt, which they do once or twice a year, we generally don’t notice it because the replacement of old feathers by new ones is staggered, with only a few disappearing and regrowing at a time. Some Northern Cardinals and Blue Jays, however, molt to the beat of a different drummer — they drop all their head feathers at once, leaving them, well, as you see in this photo. Very bald and very strange-looking. Experts believe bald birds may be juveniles undergoing their first “prebasic” molt after fledging, during which they replace all their feathers with adult winter plumage. Or maybe it’s something else. The Cornell Lab speculates that the temporary baldness could also be the result of feather mites or lice, nutritional deficits or something in the bird’s environment. 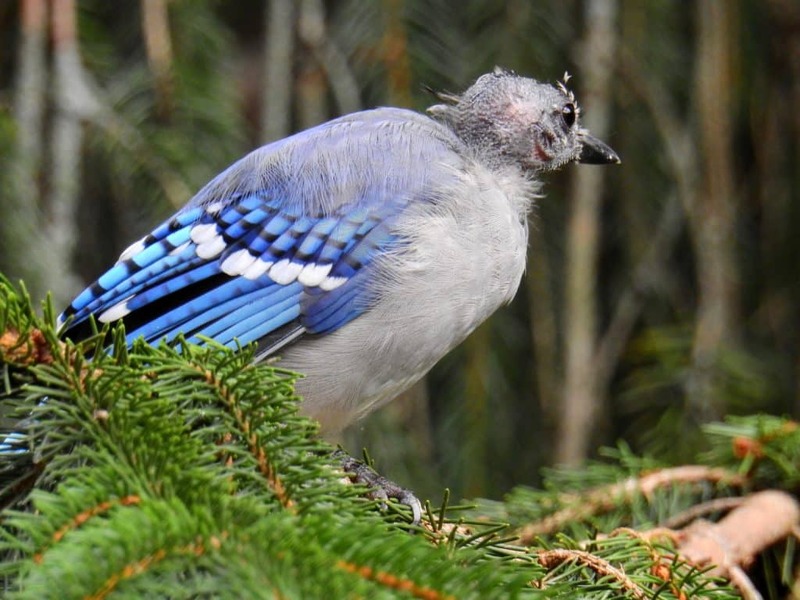 Baldness is pretty common in Blue Jays and frequent enough to be considered within a normal range among Northern Cardinals. Sometimes other species of birds become bald, too.